Fluidized Bed Systems and Methods Including Micro-Jet Flow is an invention that significantly improved the process of fluidization. Fluidization is a process where you take a mass of particles—like a pile of sand—and make it act like a fluid by shooting air into the pile. 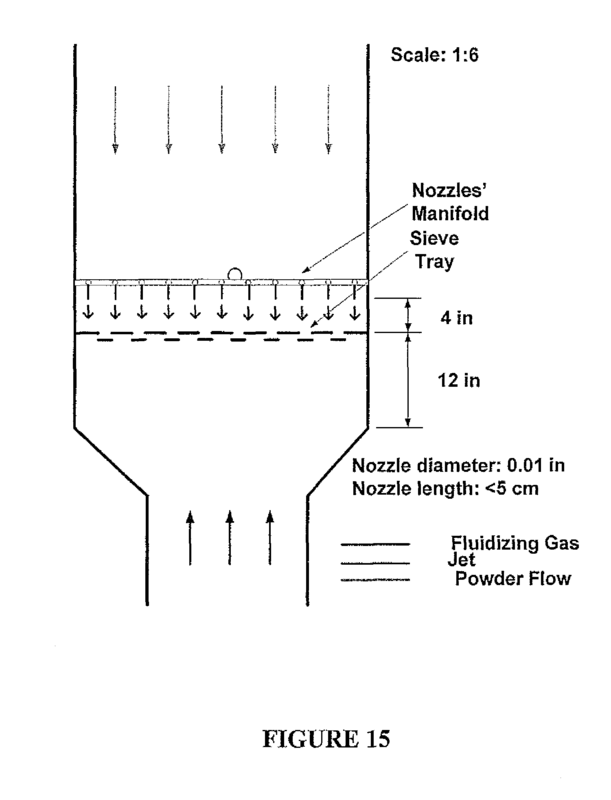 Robert Pfeffer, Jose A. Quevedo, and Juergen Flesch at NJIT invented this improvement to the fluidization process. Their patent was filed on November 9th, 2007 and granted on February 21st, 2012 as patent US8118243B2. Fluidization is an important process used in the production of many everyday objects including foods, automobile parts, energy, and pharmaceuticals. Examining the previous work of the inventors provides context for their decision to pursue improvements to the fluidization process. Jose Quevedo, who received his PhD in Chemical Engineering from NJIT in 2008, worked with his advisor, Robert Pfeffer (now Professor Emeritus at NJIT), on most of his patent applications and grants, so the two seem to come as a package deal. They have patents in means of the creation, fluidization, and usage of nanoparticles, which tend to be smaller than a common flu virus (see: US7645327B2, US7658340B2, US7905433B2, US8550698B2, and US8632623B2). They collaborated on this and other patents with German-based chemical engineer, Juergen Flesch, who holds additional patents in the fields of powder metallurgy. His patents involve applications of nano-agglomerates (agglomerates meaning “a mass of objects or a group”) in forms such as zirconium-hafnium oxide and silicon dioxide powders, which can be used in the creation of scientific tools, electronics or other metallic parts that require high precision (see: US7785560B2 and US8197791B2). The patent consists of an augmentation to the existing fluidization systems and chambers in use at the time. 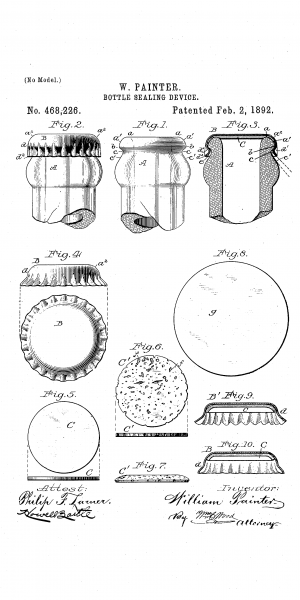 The system of the patent consisted of: 1) a fluidization chamber, the fluidization chamber configured to house a volume of nanoparticles, the nanoparticles having a particle size of less than about 100 nm; 2) a source of a fluidizing medium communicating with the fluidization chamber, the fluidizing medium being directed in a first direction relative to the fluidization chamber and 3) at least one micro-jet nozzle for delivering gas in a direction opposite relative to the first direction defined by the fluidizing medium. Although it is important to note that this configuration was specifically for use with particles smaller than 100 nanometers, the patent summary states that the method is suitable for particles up to 30 microns in size. 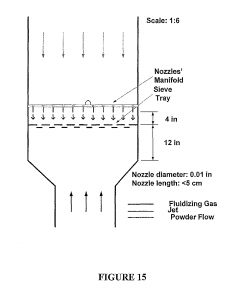 These opposite flow gas jets are the primary improvement to the fluidization process introduced by this patent. A ring with small nozzles is placed inches above the powder within the chamber. When air is forced upward through the particles and fluidizes them, the other nozzles fire downward in an exact opposite direction into the now fluid particles. The opposite direction flow creates vortexes, and this enhances fluidization and makes the mixture more uniform. Previously powders could clump together in “dead spots” around the chamber reducing the efficacy of the process. As an example of application in the food industry, Nabisco foods has utilized a similar method wherein they use a chamber for powdered food storage (powdered sugar, cereal meals, flour, etc. ), which then gets mashed down by a turning screw and then forced through a small hole to make cereal (see: US3729176A). A problem with this process is that larger particles liked to clump together and jam the screw. To fix this, they implemented a large, helical apparatus to lift the oats and other particles up, aerate them, and keep them from sticking together. A similar effect comes from our NJIT apparatus, which is much smaller—and likely far cheaper—to deploy. Another method was invented as a means of reducing contaminants such as complex bound cyanide or polycyclic aromatic hydrocarbons (see: US4648332A). The values prescribed by safety commissions and in particular the Netherlands’ Chemical Waste Act are that of 5 parts per million and 0.1 ppm, respectively. Some regions can see close to 4000ppm and 3500 ppm for these contaminants, meaning the soil must be thoroughly cleansed. To do this, contaminated soil is introduced to a fluidized bed combustion chamber, like that of the Winkler process, and the large particles sink past the flames and are collected to be broken down and reintroduced. The lighter particles along with the contaminants rise and are burned away, leaving a product of clean soil and scrub-able, mostly harmless gases. If the soil could be more efficiently fluidized, then it would require fewer passes for all of the soil to be burned through. The final process I will discuss is powder coating, which is used by the materials processing and manufacturing industries. In this process, a fluidized bed of a material, typically plastic, is formed with the intention of dipping heated metal into the mixture, melting the plastic on contact and uniformly coating your part, be it a basket, a hammer grip, or an entire car frame. Smaller parts require smaller beds. Fewer particles clump together, but the size of the bed and problem of clumped material scale together with larger parts such as car frames. These larger beds could apply a technology similar to the one described in order to keep the mixture fluidized and uniform throughout, which is important, as any clumping can cause this step of manufacture to be flawed and waste the material. The already-versatile invention of fluidization bed technology holds increasing importance in the fields of energy production, food production, automobile manufacture, and environmental disaster maintenance. Pharmaceuticals use the technology to coat pills, and even I have used the processes involved for the powder coating of my robots to leave them with a clean, sleek appearance and finalized design. With the increasing usage of the technique, a seemingly small change—simply adding another approach of air—leads to huge increases in performance, huge increases in profits, and further demand for more improvements in the field.